There are few matches in football today that throw up quite as pronounced a clash of styles as Manchester City Vs Burnley. Under their English coach Sean Dyche Burnley have moulded themselves in to a very impressive defensive side who are difficult to break down, in their second season under Pep Guardiola Manchester City seem to have adapted to the Spaniards attacking game model and are a genuine attacking threat. It remained to be seen whether Burnley could withstand the constant probing passing and rotational movement that City play with and whether the Burnley midfield could deal with the attacking threat posed by Kevin De Bruyne and David Silva moving forward from the centre of midfield to link in with the attack. Despite scoring three times away to Chelsea in the opening match of the season there are still question marks surrounding the ability of Burnley to pose a threat to the Manchester City goal in this match. The structure of the home side was never in question in this match. They started in their now traditional 4-3-3 shape although with different patterns of rotations there are no real fixed positions within the game model of City. Ederson continued in goal following the impressive start to his City career behind a back four of Kyle Walker, Nicolas Otamendi, John Stones and Fabian Delph. The Brazilian Fernandinho is the controlling midfielder and pivot at the base of the midfield with Kevin De Bruyne and David Silva. Raheem Sterling dropped to the bench for this match with Bernardo Silva coming in to the right of the attack. Leroy Sane played from the left and Gabriel Jesus continued as the lone striker. Burnley set up in a variant of the 4-4-2 which played more like a 4-4-1-1. Still without the injured Tom Heaton in goal, we saw Nick Pope continue behind a four man defensive line of Stephen Ward, Ben Mee, James Tarkowski and Matthew Lowton. In midfield Robbie Brady and Scott Arfield took up the wide areas with Jack Cork and Steven Defour playing centrally. Chris Wood played in attack with Jeff Hendrix playing a more withdrawn role. Spacing can also be applied to football and in particular to sides that have large amounts of possession in their opponents half of the field, in this match City finished with 77% possession. It also applies to sides that utilise positional play in their attacking game model, again this fits with City. The first thing to note in the above image is the width that City maintain in their attacking phase. With Bernardo Silva on the right and on the left David Silva has rotated out to the wide area with Leroy Sane moving in to the half space. The central are of the field is occupied by three City players, on in the central area and one in each half space. Immediately the Burnley defensive structure collapses back towards their own goal with both the defensive and midfield lines being flattened out. This spacing creates the opportunities for overloads in each zone across the width of the field with the threat along with the threat of the pass down the passing lanes for the run from deep. Here again we see the spacing across the width of the field from Manchester City in the final third. This time it is Bernardo Silva on the near side who has moved in to the half space allowing Kyle Walker to advance down the right hand side in the wide area. Again, there is genuine width from City with occupation of the central zone as well as the two half spaces. The pressure that the City attacking players apply on the oppositions defensive structures through this spacing and positioning is immense. Once again there are opportunities to overload any of the five zones across the front line or attack through the channels in the Burnley defensive block. The movement and spacing in this instance also creates space and time for the deeper City players. In this example we can see that Kevin De Bruyne has dropped off in to a deeper zone to take possession of the ball. With the Burnley defensive block dropping deeper and deeper then De Bruyne in particular has the quality to create chances. Slightly different this time with four advanced players ahead of the ball. The two ball near attacking players have essentially attracted four Burnley players towards them, this has a dual effect, both allowing the man in possession to play in to the close area for a one two and allowing the ball to be switched across to the weak side or threaded in to the central space for a City player to move in and attack. In the first season under Guardiola there was a general expectation among the footballing world that the Spaniard would use inverted fullbacks in the same manner that he had during his time at Bayern Munich. In practice there was a huge difference between using Phillip Lahm and David Alaba and Gael Clichy and Bacary Sagna. With the investment in the first team squad over the summer at City there was a clear move to strengthen the full back positions with Bernard Mendy, Danilo and Kyle Walker all brought in to the first team squad. 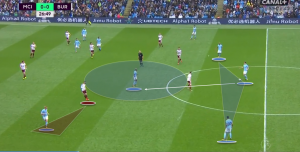 Now we see the fullbacks for City making underlapping movements in to the half spaces, or even in to the centre of the field in order to enable progression of the ball. Here we see the movements of Kyle Walker as he advances and attacks through the half space. Kevin De Bruyne has moved out and occupied the wide space dragging a defensive player out with him. Walker is then able to move and attack the space between the two Burnley defenders with the man in possession of the ball able to find his run with relative ease. This time we see Fabian Delph moving in from the left hand side in to a central zone to help City to progress the ball through the Burnley defensive block. With John Stones in possession we see Nicolas Otamendi moving out to the wide left of the field and Fernandinho dropping back to offer another passing option in front of the opposition line of pressure. Yet again we see the importance of Kevin De Bruyne who has this time drifted over to the left hand side. His movement wide seems unimportant but it drags a Burnley player across and increases the space in the central area that Delph has to receive the ball and develop the attack. Last season as City tried to adapt to the model of play from Guardiola there was an emphasis on playing out from the back, as evidenced by the signing of Claudio Bravo as a goalkeeper who could build from the back. There were still periods of miscommunication during the first season as the central defenders in particular struggled to create and recognise safe passing lanes to progress the ball in to the midfield. This season has seen a huge leap in the qualities of City’s attacking progressions as John Stones in particular has developed his ability to choose the correct passing options. Here we can see the City defender in possession as they bring the ball out of defence. Burnley were in a deep passive block with no intent to engage with the ball until it was crossed in to their own half. In this match in particular this essentially allowed the City defenders comfortable possession of the ball in order to bring the ball forwards. Here as Leroy Sane moves out of the wide area in to the half space in order to receive possession of the ball as it is played through the first line of pressure. The interesting aspect is the spacing and positioning of the other City players who are all closely connected to Sane giving a number of options for the wide player to play first time. As you can see here the Burnley attacker has moved to engage John Stones as he moves in to the Burnley half of the field. Fernandinho in the first instance moves out of the central area and drags the nearest defensive player out with him. By emptying the space in this zone Kevin De Bruyne is then able to move in to the centre to take possession of the ball from Stones. This first pass to De Bruyne immediately triggers another Burnley player to come out and engage De Bruyne. The Belgian simply bounces the ball back to Nicolas Otamendi who has space to advance in to with the ball. In an interesting choice from Sean Dyche there were two clear pressing strategies. In the beginning there was a desire to press City in their own half to prevent them from playing out from the back, Once City were able to play out of the initial press however Burnley would then drop back to in to a compact shape to protect their own half of the field. With the addition of Ederson this season City are now far more comfortable and adept at playing out from the back and through the high press. Here we see the calm nature of Ederson as he is closed down by a forward player for Burnley. City are comfortable in possession of the ball with players throughout the team being able to take possession and play in tight spaces. The initial pass moves from Ederson to Fernandinho who has dropped deeper to give a passing option. He immediately bounces the ball back and wide to John Stones and the England international is able to drive forward in to space with the ball. This match lived up to its pre match billing. Despite having 78% of possession in the match and controlling the play in the Burnley half they still only managed three goals with two coming late in the second half. Sean Dyche set his side out to deny City goal scoring opportunities and for the most part they were successful. Last season however this would have been the type of match that would have frustrated City to the point that they failed to take three points. Now however there is a sense of maturity and calmness about this City side that should see them in the title picture right to the end of the season.